Snow in August in North Simcoe seems preposterous but here it is pouring out of the mouth of a snow making machine at the Midland Ski Hills Resort. 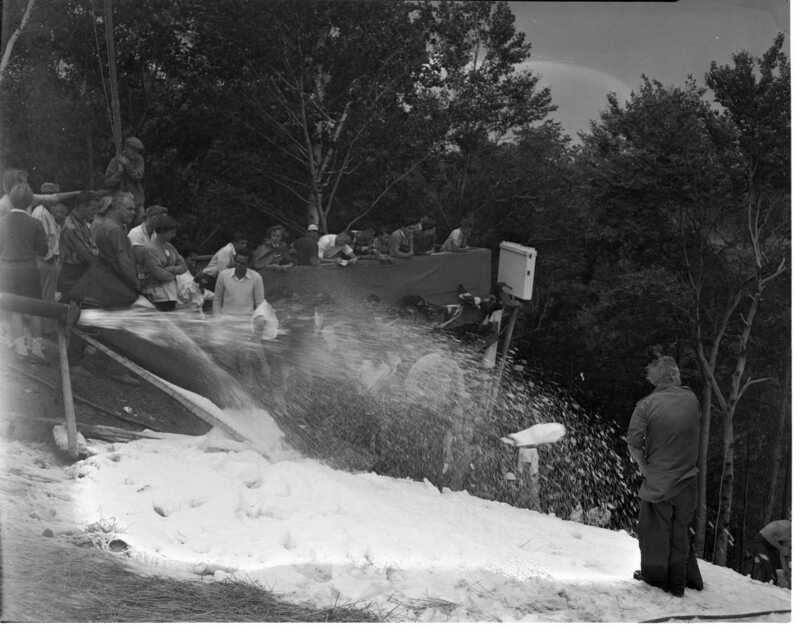 About 260 tons of ice were used to make the necessary snow for the three-day event. He soars through the air! Look close to see contestant in the air during this summer ski jumping competition that involved professionals from Canada and the U.S.A. over the holiday weekend. This scene was repeated many times over the course of the three-day event. 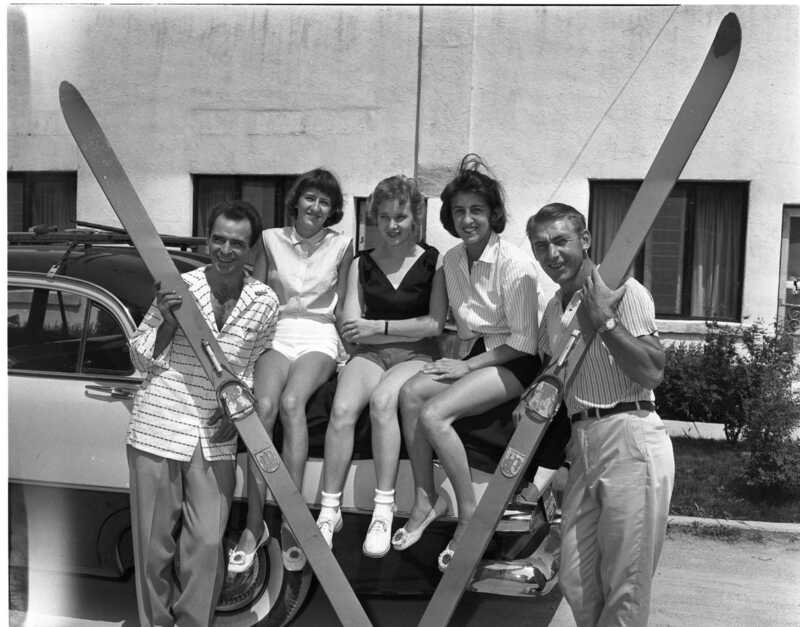 Jacques Charland, Canadian ski jumping champion, left, and Art Tokle, U.S. champ, pose with Sonia Sauvageau, Mrs. Charland and Renee Sauvageau, all of Three Rivers Que., in 90-degree heat in front of the Midtown Motel. 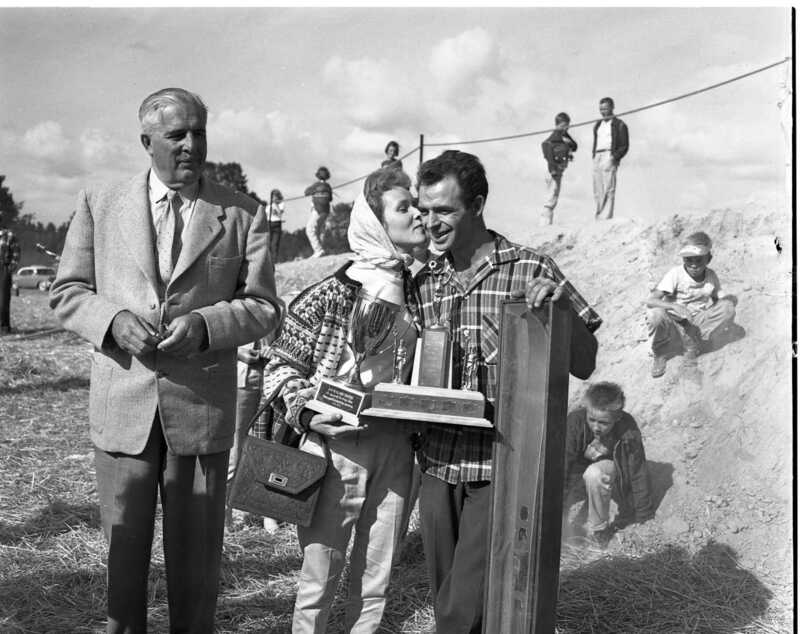 Dr. P. B. Rynard looks on while Mrs. Jacques Charland kisses her trophy winning husband at the recent International Ski Jumping competition at the Midland ski hill. Jacques has been the Canadian champ for the last four years. 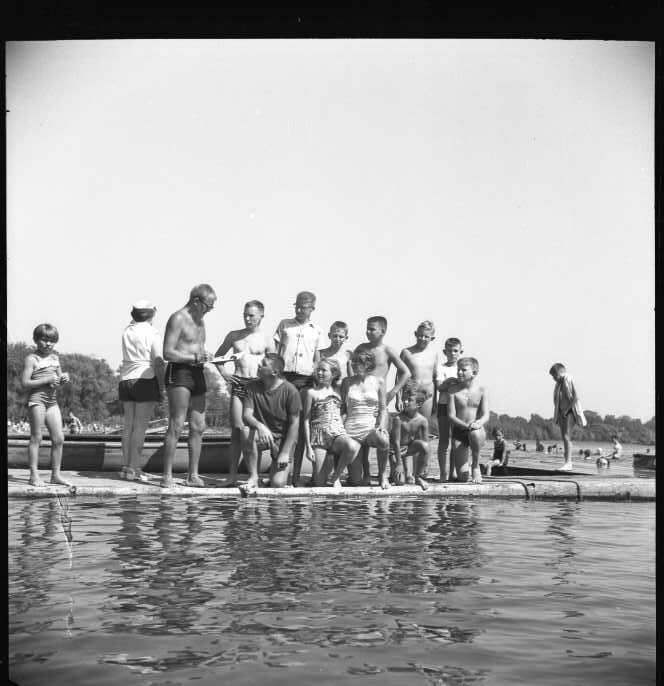 Ten boys and two girls completed the swim across Little Lake August 1st. Enrolled in the Y’s Men’s summer playground program, each will receive a medal in recognition of the accomplishment. Back row; Terry Maher instructor; Barry Follet, Port Credit; Gary Allen, New Lane N.Y.; Jim Cleaver, Midland; Jack Newkirk, Akron Ohio; John Mitchell, St. Catherines; Bob Corby, Oshawa. Front row, Gordie Hurrie, Mimico; Ann Morris, Toronto; Elizabeth Cleaver, Midland; Murray Rich, Swansea and Brian Morris, Toronto. Average time was about 40 minutes. 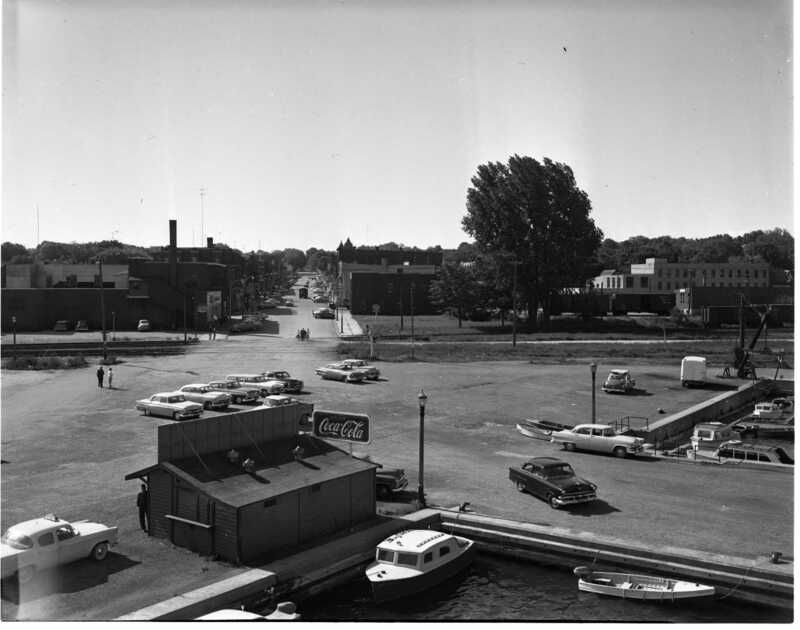 A view looking up King Street from the town dock in 1957. The photo was used to show how quiet the street was before the big holiday weekend parade and ski jumping competition. The parade is to form up near the CNR station, process up King, left on Yonge, south on Midland Ave. to Ellen and back down King Street. It is assumed the photographer got this angle from an upper deck of the cruise ship South American. Also in the photo is the Midland CPR freight shed with two boxcars on the siding, the Midland Foundry building, the boat launching crane near the small boat slips and the snack bar. Always popular with the young fry, the midget wrestlers proved Monday night they had lost none of their drawing power. 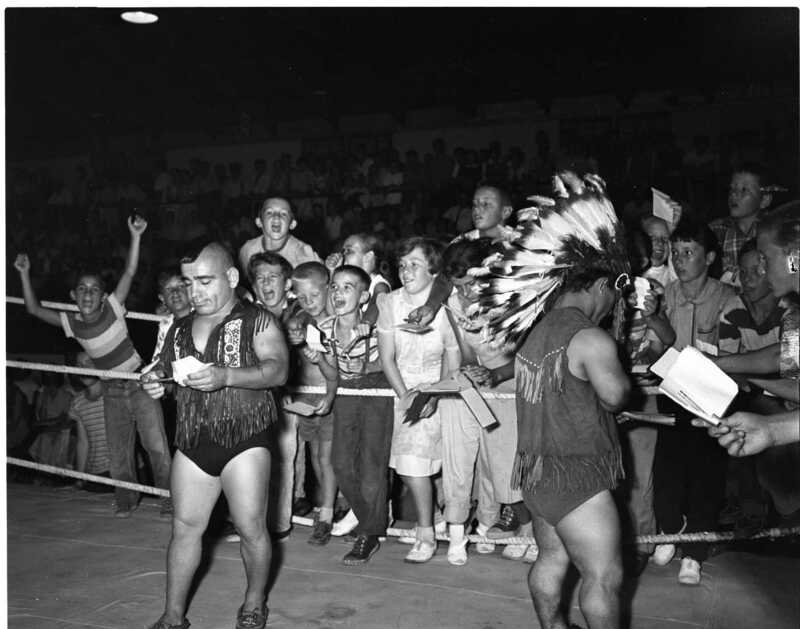 Surrounded by their admiring fans who are waiting for autographs, are Little Beaver facing the camera, and Red Eagle, the chap with the feathered head-dress standing in the corner. The bouts are sponsored as a fundraiser by Midland Minor Hockey Association. The headline Friday, August 2nd, 1957, County Herald; Say Ski Meet Invasion Likely 40,000 Strong. 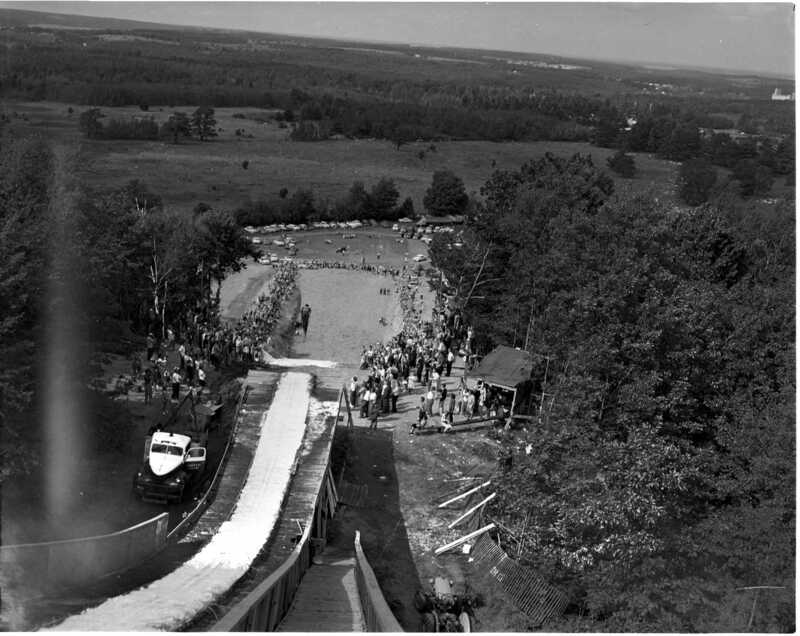 Ski club official yesterday estimated that the weekend influx of visitors for the summer carnival in Midland and the ski jump competitions in Tiny Township would hit the 40,000 mark. 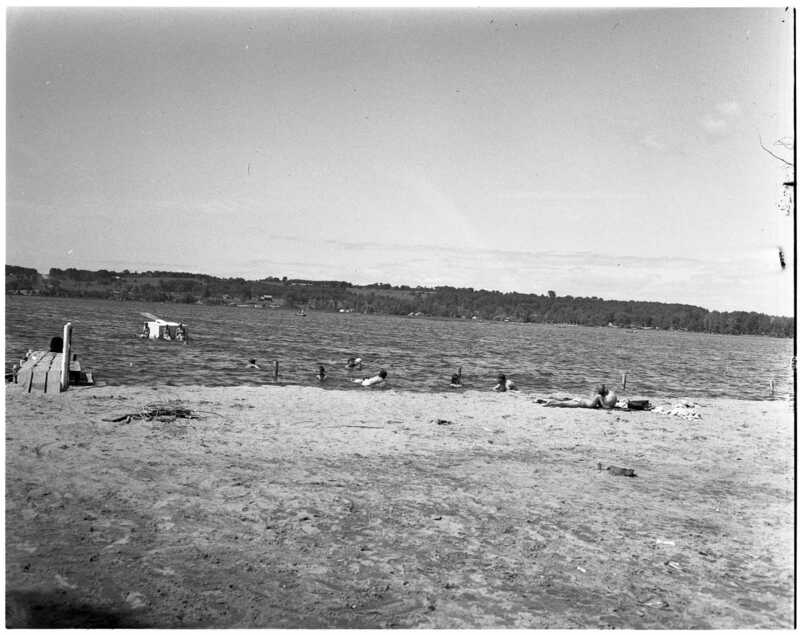 He based his estimate on the number of persons already in the area on holidays, motel reservations, expected visitors accompanying the ski jumping competitors and transient visitors drawn here by the summer event, unique in Canada. Yesterday afternoon, a check of motels in the area revealed that all were “booked solid” for the weekend. Chamber of Commerce officials said at a late hour yesterday they still had accommodation for between 500 and 600 persons in private homes, comprised of 38 regular tourist home listings and 98 who have made rooms available to help accommodate the anticipated influx. The headline August 7th, 1957, Midland Free Press; Sees Water Problem Acute By Fall, Charges Expert’s Advice Ignore. Victoria Harbour Councillor Theo Bernard contends that a serious situation exists in the village water system and claims it will become even more acute unless something is done to rectify the trouble before the freeze-up comes. Mr. Bernard said a special meeting of Victoria Harbour Council will be held Thursday night to discuss the He charged that while the council is aware of the condition, most of its members are ignoring advice offered to them at their last meeting by consulting engineer Stuart Keyes of Orillia. Attaching no blame to anyone in the death by drowning of two-year-old Patricia Buchan in Hog Bay last Saturday afternoon, a coroner’s jury in Penetang yesterday recommended licensing of boats and motors. The verdict, read out by Coroner Dr. T. Weldon, so far as it concerned boats, was: “We strongly recommend that all small boats be licensed so that boats will not be overpowered nor be allowed to carry a larger load than the construction of the boat will allow.” At the time it turned over, it was carrying the two men, their wives and the child. The power plant was a 35 h.p. motor. Wm. Campbell admitted the boat was not licenced when questioned by Crown Attorney Wm. Thompson. Touching on testimony that Mrs. Buchan was the only one wearing a life preserver, the chief recommended that these should be worn at all times by all persons in high-powered boats. Gerald Dyer, a farmer on Con. 2 Tiny Township, died at Wymbolwood Beach Wednesday evening after he suffered a seizure while swimming in Nottawasaga Bay. Mr. Dyer’s son, David, was with him at the time and found it impossible to pull his father from the water. He ran shouting for help, and after the 63-year-old man was brought to shore. Dr. D. J. Patchell examined the man. Midland firemen worked on him for about an hour with an inhalator. According to Tiny Township police, Mrs. Dyer was also nearby at the time. Police are trying to contact another son who is believed to be working somewhere in the north, and have enlisted the aid of radio stations to relay the word of his father’s death. Married to the former Alice Lyons, Mr. Dyer farmed on Con. 2 for more than 30 Besides his wife, he is survived by seven children, two of which are at home. Jos. Dyer, an Elmvale area farmer, is a brother. Funeral service will be held at the church in Wyevale at 2 p.m. Saturday. A resident of Midland for 30 years, George Sidford Tatham died Sunday at his home, 226 Sixth Street, Midland. He was in his 68th year. A graduate of the Ontario College of Pharmacy, Mr. Tatham had been engaged in the brokerage business In Midland for a number of years. His death followed a lengthy illness. Born in Listowel, Ont. May 23, 1890, Mr. Tatham was the son of the late Mr. and Mrs. Sidford Tatham. 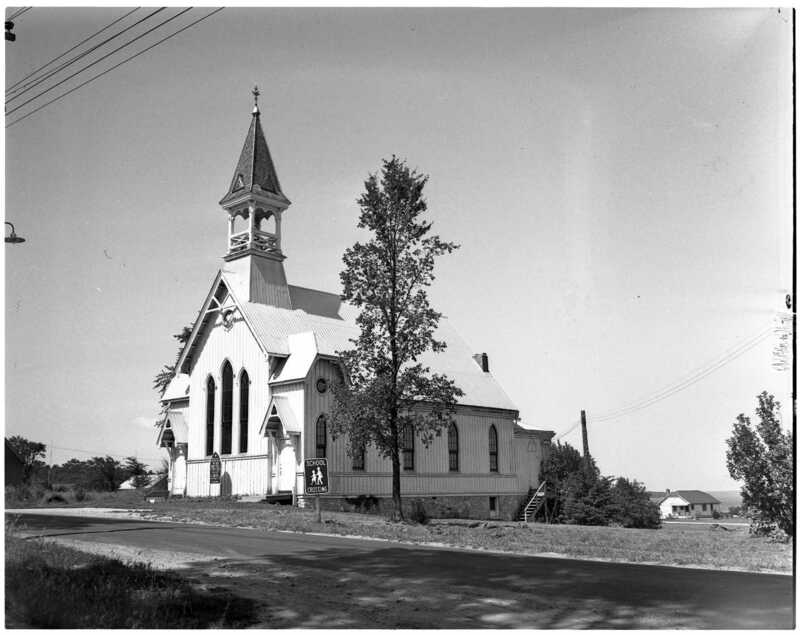 Member of the United Church, Mr. Tatham had also served on Midland town council. Hunting and fishing were his favourite hobbies. Surviving is his wife, a daughter, Betty, and son, Erskine; Miss Bea Tatham, of Listowel a sister; and his brother, Charles Tatham, Woodstock. The pace at which Midland Indians have been moving of late in the Bruce Baseball League race seems to indicate they’ll be hitting peak form just at the right time. Playoff time that is. With but one game left in the regular schedule, that being a postponed one here against the Stayner Motormen, the Tribe gave ample evidence of both hitting power and sharp fielding at the town park diamond on Monday evening in a convincing 11-6 win over this same Stayner nine. The Civic Holiday triumph before a large and appreciative crowd not only avenged a 10-5 setback for Indians in Stayner last week but also helped erase the memory of an early season 3-0 shutout registered here by the visitors. Ten Years Ago This Week; Work was rapidly being completed on the new Midland Footwear plant, Elizabeth Street, E., Midland. It was expected production would get under way by the end of September. 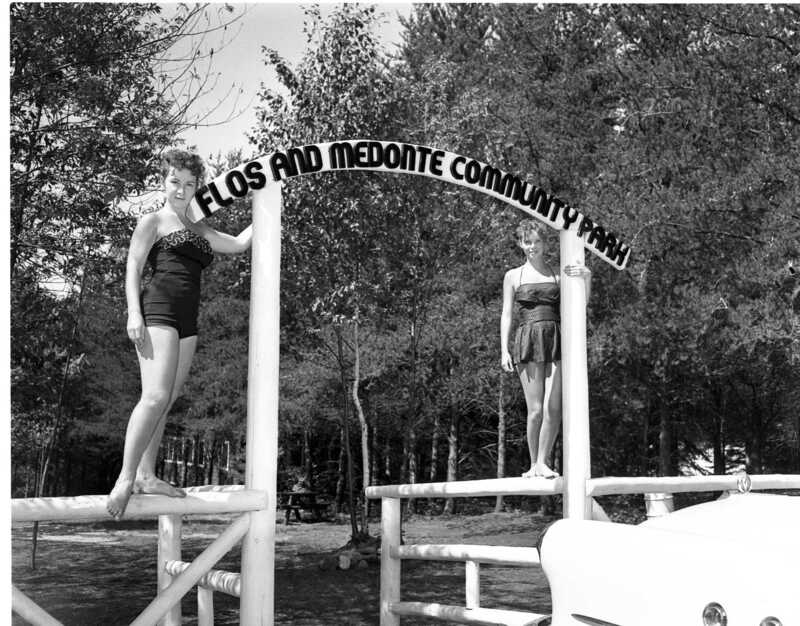 * * * The Dionne quintuplets paid a surprise visit to Martyrs’ Shrine, Midland. They toured the church, shrine grounds and Fort Ste. Marie, had dinner and motored to Lafontaine. After inspecting the church and convent there, they motored to Thunder Bay, returning in the evening to have supper with Rev. T. Marchildon at Lafontaine. * * * One of the newest small industries to locate in this area, the Superior Toy Company at Waubaushene expected to get into production within a week or so. 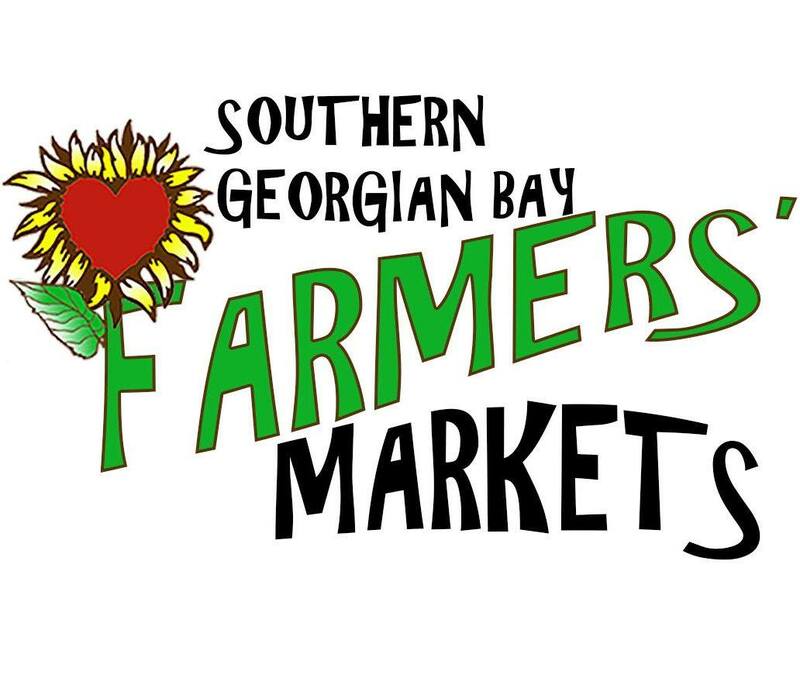 * * * Transportation companies, resorts and retail stores reported that the Civic Holiday weekend influx had hit a new high. Every cabin, resort and hotel were filled, it was reported, and accommodation in tourist homes was difficult to find. * * * Archaeologists from the Royal Ontario Museum, excavating at the Ossossane ossuary in Tiny Township, uncovered a green skull. * * * Port McNicoll had engaged a community manager and engineer. The village was one of few in Canada to have such a man on its municipal staff. * * * More than 3,000 Penetang persons took advantage of the free chest x-ray service of the Gage Institute—sponsored by the Kiwanis Club. The clinic was held in the new public school. Penetang Fire Brigade, under Chief Bob Stewart, again carried off three trophies at the annual Ontario Firemen’s Tournament in Waterdown Wednesday. With 16 firemen present, the Penetang group took first place in the ladder race, second in the rescue race, and the top prize for the brigade from the furthest distance. This makes the third consecutive year Penetang has carried off honours at this tournament.